The Chinese team explores the dynamics of the insurgency of multiple counter and alternative public spheres in the context of Guangzhou (mainland China) and Hong Kong characterised by authoritarianism and post-colonial power. They focus on women organisations and activists, their uses of new media and online platforms, and their implications for citizenship. The team is undertaking field work in Guangzhou and Hong Kong, conducting interviews with both members of established women NGOs and online activists engaged in the online citizen rights movement. The Sri Lankan team is researching women's engagement with two initiatives using new media at the local and national level. At the local level, the team is studying Minmini News, a network of rural women in Batticaloa district, and its impact on women's access to knowledge and their empowerment through shared information on socio-political events along with their active engagement with socio-political structures and spaces. They further explore the influence of these processes on women's social reality and on their relationship to new media. At the national level, the team is analysing the new media campaign launched by the Women and Media Collective, which focuses on the importance of increasing women's participation and representation in mainstream politics. The upcoming elections in March will be an opportunity to document women's awareness and engagement in the process, as well as the impact of new media. The Filipino project will create an online platform that will serve as a space for the experiences, needs and desires of marginalised women, men and youth in order to influence law-makers into passing a reproductive health law. After having launched the website and an online newspaper, the team has trained community-based activists on basic computer skills: news and feature writing, blogging/internet journalism, basic photography, newspaper and website management. The activists will generate stories grounded in everyday realities of their communities, more specifically about the need of marginalised women, men and youth for reproductive health services. The Thailand and Taiwan team, whose research focus is the use of ICTs by women migrant domestic workers’ organisations in Hong Kong and Taiwan, has identified migrants to interview through collaborative work with local organisations. Their preliminary work has enabled them to map the many dimensions of the topic, articulating clearly the gaps in the existing work but also the current use of ICTs by women migrant domestic workers, the obstacles they face in accessing technology and the multiple potentials of mobile phones for political engagement. Binitha Thampi and J. Devika will work on the empowerment of women political leaders at the local level, exploring the role of ICTs in effecting their substantive representation in local institutions in Kerala (India). They will build on previous research with women leaders of village panchayats in Kerala that has shown the crucial role of access to information in enabling women to hold their own against the entrenched patriarchal attitudes of both local politicians and officials. The Kerala team believes that this situation can be improved inter alia through the deployment of a knowledge network. The network will be created by linking the existing support groups of outgoing women presidents of panchayats with the next generation elected women representatives. The operative idea being the active sharing and learning from each others experiences and becoming a stronger collective. Furthermore, the training material of the Kerala Institute of Local Administration (KILA) will be digitised and put in the public domain. The research promises to bring valuable insights about the role of knowledge access for women's empowerment. Ananya Raihan, Mokhlesur Rahman and Umme Busra Fateha Sultana will work on the influence of new media on women's political decision-making in Bangladesh. They will explore new media's contribution in creating both discourses on women's rights as citizens, and possibilities for marginalised women to renegotiate these rights in their local contexts. Through a series of steps, the research aims at understanding the level and extent of marginalised women's participation in creating these discourses through new media. A citizen journalism platform www.write3.com was launched in January – one of the main themes being women's citizenship. It has a mobile phone-based application, which enables users to upload photos, video or audio messages. Workshops will be organised to train representatives of grassroots organisations to use the platform and its applications. The process will be taken further in two locations through in-depth interviews of selected marginalised women and “Info-ladies” who mobilise women for claiming their rights. In a country where women are still highly discriminated in gaining formal citizenship, such a study will help investigate the impact of new ICTs on gender and citizenship. Farida Shaheed (Pakistan), Supinya Klangnarong (Thailand) and Margarita Salas (Costa Rica) have joined the network and will contribute to the programme by writing conceptual think pieces. These will be based on an in-depth scrutiny of the information society contexts in their respective countries. Their work will help support the building of the theoretical framework on gender and citizenship in the information society. Each research will have a specific scope in addressing issues of participation and citizenship of marginalised women within the larger context of ICT diffusion. You can find more information about the think piece writers on the CITIGEN website. What would you like to report back since the programme started? That’s a big question! I guess I would like to report that I am glad that APWLD is a part of this programme and that the project is successfully continuing as planned. I am also excited to see what the other groups have been up to with their projects and what the two new groups are planning to do. How is your participation in the programme enhancing your own work and understanding of the research field? I have to say that it has had a bigger impact on my own work in the Labour and Migration Programme at APWLD than I thought it would. Before starting this project, I thought I was reasonably tech savvy, however I can definitely say that in the process of doing the State of the Art alone, I have fast become much more savvy, in particular in the use of ICT as part of campaigning. My work plan this year now includes a on-line campaigning element, which incorporates information, a case study and a email that participants can sign up to send to governments. We are also looking into redeveloping the blog for the United for Foreign Domestic Workers Rights (UFDWRs) coalition, which APWLD is the co-secretariat for. This has stemmed out the interest I have developed in ICT and from being a part of this programme. What are the challenges you are facing in implementing your research? As our project is not national this always causes some extra problems in terms of research and the consultative forums, things took longer to get rolling than I would have liked, but at this stage I feel that the project is moving smoothly and is well underway. It was always going to be difficult to interview migrant domestic workers when they often do not have days off and it would be ineffective to interview them in their employers house. However, the local organisations which we are working with have identified women who are migrants themselves from the Philippines and Indonesia to do the interviews and we believe that they will be successful in making the women feel comfortable enough to answer the questions during the interview. I also found during the literature review, that there is a lack of information and analysis of how organisations organise migrant workers, and there are definitely not many who discuss the use of ICT in organising migrant workers, therefore the field research has become even more important in understanding these aspects. What do you expect from the programme? As a member of the network, as an individual researcher, etc. From this programme, IT for Change and APWLD now have a connection and hopefully the two organisations will continue to work together after the programme to benefit from each others strengths to carry on our campaigning and advocacy work. For myself, I will continue to be a part of the network and I hope to learn from others who are successfully using ICT in the NGO field, as well as to learn from their mistakes and problems! Anandhi S., Velayudhan M. (2010), 'Rethinking feminist methodologies', in Economic and Political Weekly, XLV (44), pp. 39-41. Avgitidou S. (2009), 'Participation, roles and processes in a collaborative action research project: a reflexive account of the facilitator', in Educational Action Research, 17 (4), pp. 585-600.
duPont S. (2010), Information & Communication Technology in Mexican civil society. Overview and case studies. Retrieved from http://ndn.org/sites/default/files/paper/duPont_ICTMexicanCivilSociety.pdf, 1 February 2011. Gaventa J., Barrett G. (2010), So what difference does it make? Mapping the outcomes of citizen engagement . Development Research Centre on Citizenship, Participation and Accountability. Retrieved from http://www.drc-citizenship.org/Publications/WP347.pdf, 5 February 2011. Special issue of The Electronic Journal of Information Systems in Developing Countries on ICTs and Development: Theories and Evidence. Available at http://www.ejisdc.org/ojs2/index.php/ejisdc, 31 January 2011. 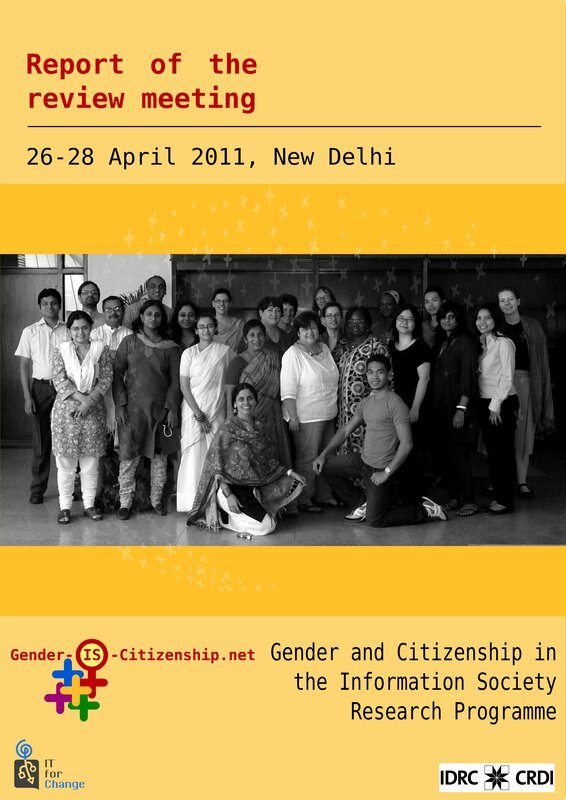 The second meeting of the CITIGEN research network will take place on 26-28 April 2011, in New Delhi (India). The review workshop will bring together all the research partners, as well as most of the think piece researchers and a few scholars from the global South in order to broaden and enrich the debate. The background note of the workshop is available here. Two of the CITIGEN think piece researchers have already submitted their draft, promising fascinating avenues of reflection through their examination of different dimensions of the gender and citizenship nexus in the information society context. Margarita Salas is working on the emerging information society context in the Central American region to address issues of participation and citizenship of marginalised women. She has interviewed the key stakeholders from the region, both from the women's movement and from the open culture/free software networks. So far, two relevant issues have emerged. On the one hand, there is a gap between discourses and practices in the information society: the country plans and reports extensively use the social inclusion language but this discourse is not backed by country-level initiatives. On the other hand, there is a lack of regional, or national, advocacy initiatives directly linked to the information society. Even though the feminist movement uses ICT tools for its advocacy work, it does not build a political analysis of the global implications of the information society. Farida Shaheed is exploring the relationship between the virtual world of ICTs and the tangible world, with its grounded realities of everyday life where the struggles for and shifts in power take place. She explores two dimensions: the importance of ICT linkages with the news and broadcast media, and the individual vs. collectivised actions in social movements' work in the digital era. She stresses that even though ICTs may bring dynamics that will reconfigure gender spaces and frontiers, the Pakistani case shows that what enters the 'private' sphere of women can be deeply misogynist, and result in women making ‘choices’ that challenge prevalent feminist thought. 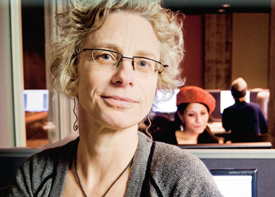 Furthermore, Heike Jensen has joined the network as a think piece researcher. She will be writing on the gendered experiences of censorship and surveillance with regard to sexuality, basing her argument on the theory that any nation state is principally invested in the reproduction of its citizenry in both ideological and material ways, which converge in issues of (hetero-) sexuality and biological reproduction. She thus juxtaposes elements of the Internet Governance debate (censorship and surveillance) with dimensions of the feminist and citizenship discourses (communication rights and privacy). Her paper will explore experiences of offline and online censorship and surveillance in order to recast questions of women's potential citizenship in the information society. We focused our research in Guangdong (GD) province of China in the first half of our research. Apart from reviewing the historical context of the feminist movement in China, we have interviewed 8 NGO organisers from a semi-governmental organisation (GD All China Woman Federation), and members from a professional woman network, as well as four independent woman activists, about both their personal and organisational history, and their experiences in using ICT for advocacy. We will start analysing the differences in their advocacy discourse on the Deng Yujiao case. As for the Hong Kong part, we have finished the organisational analysis of the Association for the Advancement of Feminisms and working on the history of feminist movement in Hong Kong. We have identified 12 interviewees for the project and will start conducting the interviews in early April. As for the case study, we have gathered all the basic information for further analysis. Do the interviews undertaken so far confirm or not your initial hypotheses? The individual woman activists and the small feminist network in China are overlapping in their social network. Whether they engage with an issue independently or work with the network depends on the nature of the issue. The semi-governmental organisation (GD All China Woman Federation), in response to the new rise of opinion leaders (many are political dissidents) on the Internet, attempts to engage with online public discourse and channel public opinion in order to achieve better "social management" put forward by the CCP. The research shows that, due to the authoritarian rule, individuals, professional network, semi-governmental organisation and the party-state interact and negotiate with one another in the formative process of "public opinion", rather than following the dynamic of "state versus civil society". It has been quite difficult to approach the established semi-governmental organisation and we were about to give up the interview part. However, thanks to individual connections, we managed to hook up with the Sun Yat Sen University Media Anthropology Laboratory as researchers, and with the help of a friend's friend, we managed to have some interviews with the organisation. Such an arrangement cannot be possible if we go through the official channel; it shows how work is done informally in China. We tried to limit our research in GD province. However, for individual women activists, their engagements are usually cross-regional or national. Because of our geographical assumption, we did not interview individuals beyond GD province. However, such an assumption is not valid among individual activists and has limited our choice of selecting interviewees. Now we approach the activists whose work places and residences are largely located in GD. How do you foresee the impact of your study for your own understanding of the field, as well as for the people you are interviewing and their practice of online activism? The research will contribute to the discussion about the state, civil society relation in China and the impact of online citizen movement on the authoritarian regime. The interview is a reflexive process for organisers and actors. It probably helps the professional woman network to re-strategise their relation with the semi-governmental organisation. We plan to have an exchange between Hong Kong and GD activists for the research initial finding and hopefully will help organisations and activists from the two areas to develop some collaborative project in developing online feminist discourses. Bennett R. (2010), Going mobile – Technology and policy issues in the mobile Internet. Retrieved from http://www.itif.org/files/100302_GoingMobile.pdf, 4 April 2011. Learners, practitioners and teachers . Handbook on monitoring, evaluating and managing knowledge for policy influence (2010). Retrieved from http://partnerplatform.org/file2.axd/4a73d45a-24b8-4058-a4f2-ffc1d7cd39ae/MandE%20and%20KM%20Handbook.pdf, 4 April 2011. Wikipedia entry on information literacy. Retrieved from http://en.wikipedia.org/wiki/Information_literacy, 4 April 2011. Zuckerman E. (2010), 'Decentralizing the mobile phone: A second ICT4D revolution? ', in Information Technology and International Development, 6 (SE), pp. 99-103. What conceptual threads did you see emerging at the conference? What ideas did you find intriguing? In thinking about the conference and reviewing my notes on the presentations, I am struck by how many of the representatives of the research groups and authors of the think-pieces are interrogating and refining the concepts that are critical to understanding gender and citizenship in the information society, including those that are central to their own research and practice. As a “public sphere theorist,” not surprisingly, I was very interested in the attention directed to issues of “private” and “public” in respect to gender and the information society. I have been intrigued by the “importation” of the concept of the public sphere into Asian contexts for a number of years, so I suppose that it was not surprising that I raised this issue with the China team in particular since the People's Republic of China was such as vocal advocate of “Asian values” in the “Asian value debate” over human rights. It seemed that a number of participants were concerned with the risk of becoming overly technologically-deterministic, which is very much a risk of conducting research that takes on the issue of access. Yet, many participants had a healthy scepticism about access-is-everything approaches, and I recall that one participant commented that “openness” on the Internet is not the same as “equality.” Participants overwhelmingly refused the notion that the Internet is a great equaliser. Whether “the Internet” has the potential to equalise is another question and depends on what one means by “the Internet,” but that’s another subject, too unwieldy to address for purposes of this interview. As an advisor of the project, how do you envision the future of the network on basis of the ideas that emerged during the workshop? I suppose that I don’t need to remark on how critical it is to have funding to have a future? Bracketing this question, I think that all of us have learned a great deal since the inception of this programme – not only from the research reports but also from the interaction overall. As with all projects with which I am familiar, one had to learn to expect the unexpected, put the care and effort into understanding the ideas and circumstances of other participants, let patience, strategic thinking, and an orientation toward results – and, what I have called the “legacy” of the research – be one’s guide. I hope that the programme continues, and I believe that the network can continue regardless. One aspect of the programme that worked very well should be mentioned: the relationships among academics, activists/advocates, and practitioners were among the best that I have encountered in many years of working with, and for, groups that are not part of my academic world. After many years of telling colleagues that there are not so many differences in knowledge and concerns between many academics and advocates/practitioners, I feel as though this project has solidified my case! The first output of the research teams is a State of the Art document, which is an analysis of the current state of the field researched. It includes a literature review, based on the hypothesis developed in the research proposal. This first stage will provide the basis upon which the field work and the analyses will be built. Read the documents here. Anita Gurumurthy, IT for Change, participated in a workshop organised by APC Women's Networking Support Programme as a pre-event to the 6th Internet Governance Forum (Kenya) which took place from the 27th to 30th of September 2011. The workshop brought together 20 women from different countries to ideate on ways of putting the feminist concerns in Internet Governance agenda. To read a report on the event by Dafne Sabanes Plou, click here. We shared the emerging analysis from the CITIGEN research projects in form of a research brief, 'Insights along the way - a mid-stream report of the CITIGEN research network'. This analysis also informed our contribution to the statement by the Gender Dynamic Coalition on gender equality and women's rights in the IGF. A transcript of the deliberations has been put up on the IGF website, while the statement itself can be found here. Binitha V. Thampi and J. Devika from the CITIGEN network attended the 2011 Women in Politics conference that was held in Dili, East Timor between 29 September – 1 October. Titled 'Amplifying the Voices of Women in Politics: The Second Asia-Pacific Conference on Women in Politics and Governance', the conference provided an opportunity for feminists from the region to collaboratively ideate on the issues and challenges that women's participation in politics has thrown up. Binitha and Devika focussed on deployment of technology for feminist ends – the inherent possibilities and the attendant problems. The workshop was divided in three parts and in each part collective reflection by the participants followed the team's presentation. In the first part, the need for feminists to engage with technology and the political significance of the same was discussed. This shared understanding provided the ground for the next part, where the practical difficulties in persuading women to use technology and its networking possibilities was discussed. The team shared the Gramamukhya experience in this segment. Next, the experience of setting-up the website and related details like the structure and design of the website, the rationale of the contents on the website and their development were discussed. Many women, for example women MPs of Timor Leste, shared with the team that such platforms would be useful for their own struggles. Such links, forged with feminists working in different contexts, made the conference an enriching experience for the Kerala team. One of the central ideas of CITIGEN – ways and means of actualising citizenship for women in the emerging information society – was conveyed by the Kerala team in their intervention at the Women in Politics conference. Three new contributions were made to the existing CITIGEN outputs by think-piece authors Margarita Salas, Farida Shaheed and Supinya Klangnarong. Think Pieces are paper contributions by prominent scholars and practitioners studying the intersections between the micro-context of community information ecologies and macro socio-political developments. 'Gender and information society in Central America: Between the immediate and the strategic scenarios' by Margarita Salas provides an overview of the feminist struggles and their engagement with ICTs, embedded in the political and economic realities of the Central American region, specifically in Honduras, Nicaragua, El Salvador and Costa Rica. The paper examines the interaction between the global, national and the community contexts and studies the need for and the depth of engagement with ICTs required by feminist movements in the region. 'Gender and citizenship in the information society: A perspective from Pakistan' by Farida Shaheed explores the emerging information society context in Pakistan, analysing subjectivities in relation to the emerging digital ecologies. The paper begins with a brief overview of some of the key issues related to female citizenship and goes on to examine the breaching of the jealously guarded borders of the traditional private-public spheres through the medium of radio, that influenced isolated women to support instead of oppose, the regressive Taliban agenda in Swat. The final section of the paper reflects on the opportunities afforded by social network media and digital technologies for those with access to reconfigure the meaning of citizenship, based on the experience of activism and humanitarian relief in Pakistan. 'Internet rights, netizen's sub-culture and gender perspectives during political transformation in Thailand' by Supinya Klangnarong provides a snapshot of the current usage of ICTs in Thailand using gender aggregated data, followed by an account of the political resistance being built by Internet users or 'netizens' in order to counter government restriction and control over the freedom to access and express using online spaces. The paper explores the possibilities of new media spaces, typified by 'free culture', for discourse shaping in areas of not only civil and political rights but also gender justice. The paper ends with relevant policy recommendations. IT for Change, is working on two think pieces to add to the knowledge pool of the CITIGEN network. From our experience in India, and from many case-studies across several other developing nations, two phenomena have caught our attention – the first is the rapid diffusion of the mobile phone network and the second, the new community institution called telecentres, used for different interventions spanning a range from service delivery, to capacity building and empowerment. In the below papers, we approach both phenomena with a gender and information society lens. Mobile phones for development : The unique qualities of the mobile phone have positioned it as an increasingly favoured tool for supporting development aspirations, as it enables individuals to be uninterruptedly connected to the network, allowing them to transcend temporal and spatial constraints, along with absorbing the characteristics of other ICTs. The exponential growth of mobile technology and its penetration of markets in the global South, inter alia as the preferred way to access the Internet, has only added to the growing excitement. Using an information society framework, our paper examines the mobile phone phenomena, the ideologies which inform its architecture and usage in the development sector, focussing in particular, on the nature of the female subject thus created. By incorporating a feminist lens, our analysis encompasses both the gendered nature of the emergent techno-social paradigm and a nuanced understanding of the possibilities that mobile technology might hold for breaking traditional gender norms and be truly transformative. Chloé Zollman and Arpita Joshi from IT for Change made a presentation entitled 'Recasting the potential of mobile phones for gender equality' at the MobilePlus Conference, held in MSSRF (Chennai), 15-17 September 2011, reflecting on the emerging analysis. 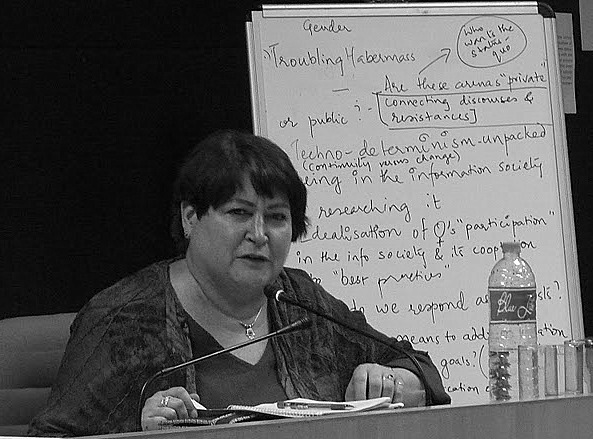 Gendering telecentres - an institutional approach : The pros and cons of telecentres / community access centres, understood as decentralised, technology-enabled spaces located within communities to meet several development ends, have been widely debated and experimented across the global South. In our paper we explore three case studies showcasing different models of telecentres, run by different agencies to meet diverse ends; looking in particular at the possibilities they offer for women's empowerment. The case-studies undertaken are: the Gender Resource Centre – Suvidha Kendras (GRC-SKs) of the Mission Convergence, Delhi; the Community Learning Centres (CLCs) run by Self Employed Women's Association, Gujarat; Kutch Nav Nirman Abhiyan, Gujarat. 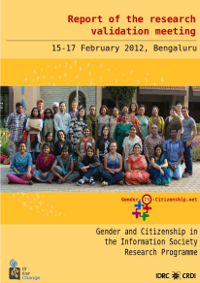 Activist-scholars of the CITIGEN network who have been working on different researches to study women's participation and citizenship in the information society, met in Bengaluru (India) from 15-17 February 2012 at the National Institute of Advanced Studies. The meeting brought new scholars into the network and discussed the findings of the research studies. It was also an occasion for the network members to reflect upon the questions and concerns framing the research endeavour to plan the next steps. Read the 'CITIGEN Research Validation Meeting Report'. View the interviews from the meeting here. The fifth international conference on Information and Communication Technologies and Development (ICTD 2012) hosted at the Georgia Institute of Technology was held from March 12-15, 2012 in Atlanta, USA. 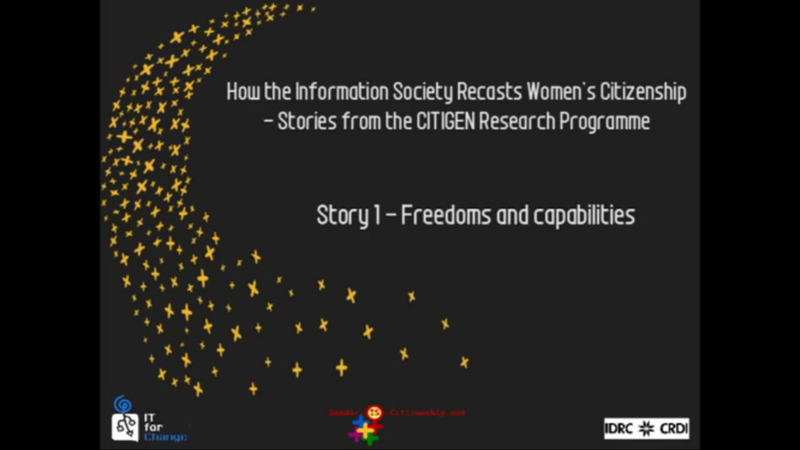 CITIGEN participated and held an open session titled 'How the information society recasts women's citizenship – Stories from the CITIGEN programme'. Anita Gurumurthy, Desiree Lewis, Kate Lappin and Parminder Jeet Singh represented the network at the event.The CITIGEN session was divided into four sections, each of which were supported by short movies created to share the views and images from the CITIGEN research. These movies can be viewed here. This think piece builds on the insights from the work of CITIGEN. It brings together the conversations among the network of involved feminists through July 2010 to February 2012, to posit some key points of departure in feminist analyses, which could form tentative steps towards a feminist theory of change. Click here to read the paper. The piece attempts to unravel the relationships between nation state, citizenship and the public sphere, communication and privacy rights, sexuality and morality in the backdrop of the information society and gender frameworks. The theme will be tackled by focussing on two clusters of enquiry: (1) communication rights and censorship and (2) privacy and surveillance. This approach is meant to create a feminist inroad into the prevalent, gender-blind discussions of Internet governance and citizenship that lends itself to elaborations on different levels, from abstract and theoretical hypotheses to discussions of distinct local, embodied experiences. Click here to read the paper. Desiree and Crystal focus on the local and national activism that enlist digital technology and confront violence against women as a site of innovative human rights struggles in the African region. The paper deals with feminist activism driven by electronic communications systems and hybridised forms, incorporating both traditional and new media. The study moves in-between the local, national and regional levels with the aim of teasing out the national and regional implications of local platforms and resistance. Click here to read the paper. All think pieces can be read here. A summary of the think pieces is available here. At the end of the research period, the research partners published policy briefs which outlined the critical outcomes of their research and provided policy insights. These policy briefs can be read here. 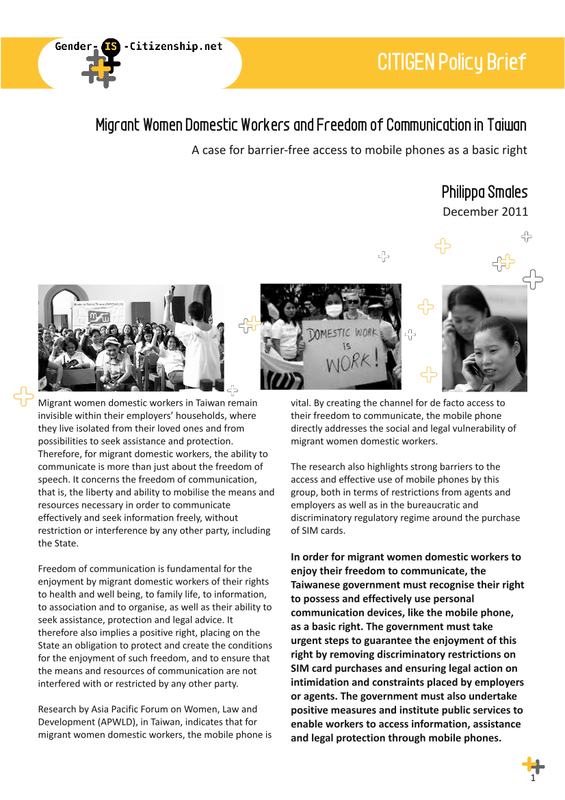 Based on the research carried out by APWLD, Philippa Smales outlines how the mobile phone is a vital tool to garner information, communicate and organise, for the vulnerable social group of migrant women domestic workers in Taiwan. This policy brief highlights the social and regulatory practices that impede access to mobile phones and provides relevant policy recommendations. Read the policy brief. 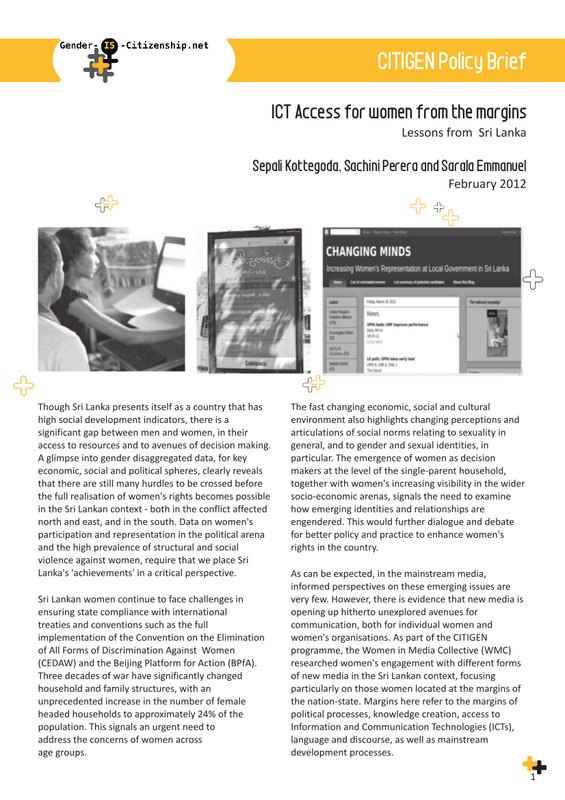 The Women in Media Collective (WMC) team studied marginalised women's engagement with different forms of new media in the Sri Lankan context. The findings from the research, especially those that provide insights on the impact of state ICT policies on women's engagement with new media, are discussed in the document. Read the policy brief. 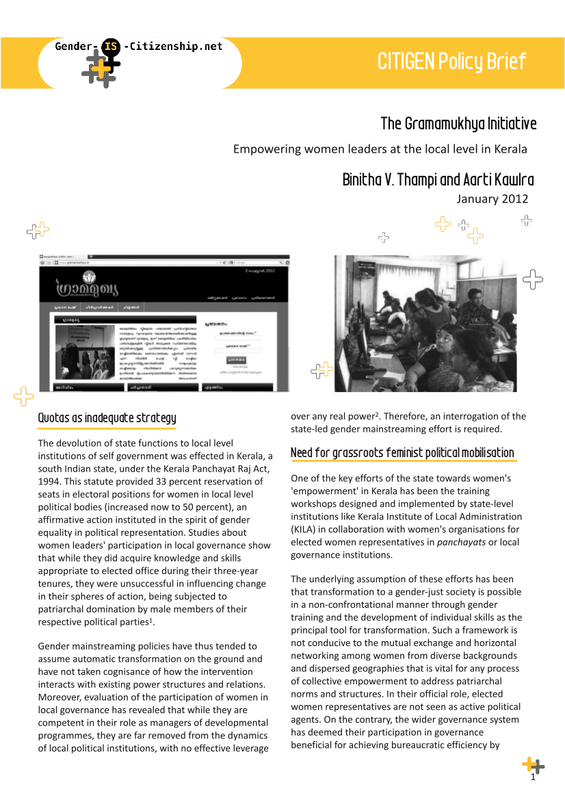 The India team created a network of women leaders in local governance through a digital platform, providing an innovative point of departure for catalysing a sense of solidarity among the women and a connection to the women's movement in Kerala. The potential of ICTs was sought to be harnessed to provide alternative spaces for the articulation of women's voices. The document captures policy insights from their research. Read the policy brief. 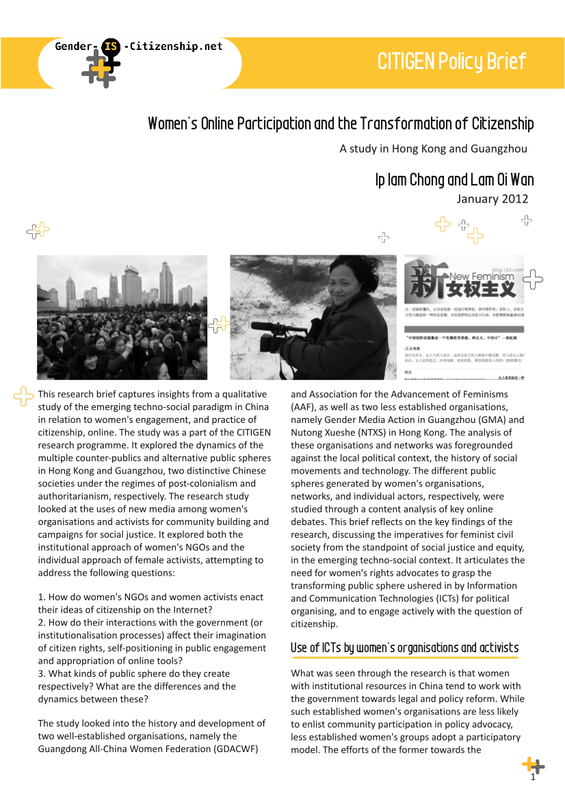 The document captures the insights from the qualitative study of the emerging techno-social paradigm in China in relation to women's engagement and practice of citizenship, online. It explores the dynamics of the multiple counter-publics and alternative public spheres in Hong Kong and Guangzhou, two distinctly different cities under the regimes of post-colonialism and authoritarianism, respectively. Read the policy brief. 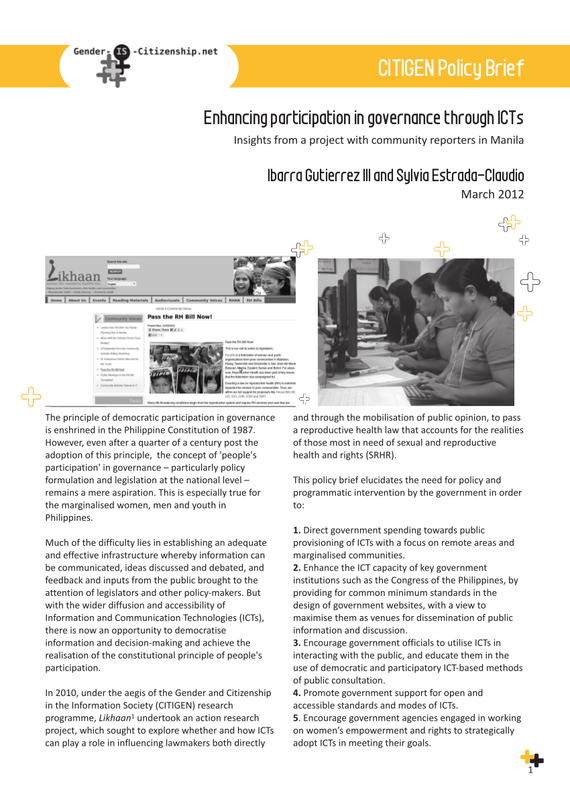 The Filipino team undertook an action research project, which sought to explore whether and how ICTs can play a role in influencing lawmakers both directly and through the mobilisation of public opinion, to pass a reproductive health law that accounts for the realities of those most in need of sexual and reproductive health and rights (SRHR). The document elucidates the need for policy and programmatic interventions by the government. Read the policy brief. Q. How does the issue of governance of digital space fit into the wider struggles for democracy and citizenship? Where do they intersect with feminist politics? A. Given the centrality of digital media in our everyday lives – for keeping in touch with family and friends, for our work, entertainment, pleasure, civic participation .... for our lives and livelihoods, the governance of digital spaces is intrinsically linked to struggles for democracy and citizenship. It’s thus really important that women be at the literal tables of policy decision-making, and that feminists be savvy about their rights as digital users. Q. What are your views about feminist theoretical endeavours in grappling with the network society phenomenon? What frontiers does feminism need to explore to retain its radical edge? A. Feminist political economy in analyses of the network society is now needed more than ever. When we consider the highly commercial nature of social media today – when a projected valuation for the $5B IPO on Facebook is estimated to be between $75-100B!, we need to ask myriad questions about who profits, and who loses, in advertiser-driven economy. Users become a lucrative audience commodity, and it’s also a very gendered audience commodity. Let’s also not lose our focus on labour and how it is gendered– the labour that is enacted in many affective and emotional ways (as users), the labour of those working in the social media companies themselves (the more corporate ‘head office labour’ – what’s the gender division of upper management, board of directors..?) and what is the labour of those working in the manufacturing and production of software/hardware, etc. Read the more detailed interview with Leslie Shade here.